This topic could be and is a full semester course at some business schools. It is a deep and rich topic that I can’t cover in one single blog post. But it is also a relatively narrow skill set at its most developed levels. If you are going to be a public equity analyst, you need to understand this stuff cold and this post will not get you there. But if you are an entrepreneur being handed financial statements from your bookkeeper or accountant or controller, then you need to be able to understand them and I’d like this post to help you do that. I’d also like this post help those of you who want to be more confident buying, holding, and selling public stocks. So that’s the perspective I will bring to this topic. In the past three weeks, we talked about the three main financial statements, the Income Statement, the Balance Sheet, and the Cash Flow Statement. This post is going to attempt to help you figure out how to analyze them, at least at a cursory level. In general, I like to start with cash. It’s the first line item on the Balance Sheet (it could be the first several lines if you want to combine it with short term investments). Note how much cash you have or how much cash the company you are analyzing has. Remember that number. If someone asks you how much cash you have in your business, or a business you are analyzing, and you can’t answer that to the last accounting period (at least), then you failed. There is no middle ground. Cash is that important. Then look at how much cash the business had in a prior period. Last month is a good place to start but don’t end there. Look at how much cash went up or down in the past month. Then look much farther back, at least a quarter, and ideally six months and/or a year. Calculate how much cash went up or down over the period and then divide by the number of months in the period. That’s the average cash flow (or cash burn) per month. Remember that number. But that number can be misleading, particularly if you did any debt or equity financings during that period (or if you paid off any debt facilities during that period). Back out the debt and equity financings and do the same calculations of average cash flow per month. Hopefully the monthly number, the quarterly average, the six-month average, and the annual average are in the same ballpark. If they are not, something is changing in the business, either for the good or the bad and you need to dig deeper to find out what. We’ll get to that. I generally like to go to the income statement next. And I like to lay out a few periods next to each other, ideally chronologically from oldest on the left to the newest on the right. For startups and early stage companies, a 12 month trended monthly presentation of the income statement is ideal. For more mature companies, including public companies, the current quarter and the four previous quarters are best. Some people like to graph the key line items in the income statement (revenue, gross margin, operating costs, operating income) over time. That’s good if you are a visual person. I find looking at the hard numbers works better for me. Note how things are moving in the business. In a perfect world, revenues and gross margins are growing faster than operating costs, and operating income (or losses) are increasing (or decreasing) faster than both of them. That is a demonstration of the operating leverage in the business. But some early stage companies either have no revenue or are investing in the business faster than they are growing revenue. That is a sound strategy if the investments they are making are solid ones and if they have a timeline laid out during which they’ll do this. You can’t do that forever. You’ll run out of cash and go out of business. From this analysis, you may see why the business is burning cash or burning cash more quickly or less quickly. You may see why the business is growing its cash flow rapidly. I am most comfortable when the monthly operating income (or losses) of a business are roughly equal to its cash flow (or cash burn). This does not have to be the case for the business to be healthy but it means the business has a relatively simple economic architecture, which is always comforting. From Enron to Lehman Brothers, we’ve learned that complex business architectures are hard to analyze and easy to manipulate. One thing that bears mentioning here are “one time items” on the Income Statement. They make your life harder. If you go back to the Income Statement post and look at Google’s statement, you’ll see that in the first year of their presentation Google made a one-time contribution to the Google Foundation. That depressed earnings in that period. You need to back that one time charge out for a consistent presentation, but you also need to be somewhat suspicious of one-time charges. Companies can try to bury ongoing expenses in one-time charges and inflate their earnings. You don’t see that much in startups but you do in public companies and it’s a “red flag” if a company does it too often. If the monthly operating income (after backing out one-time charges) doesn’t come close to the monthly cash burn rates, then something is going on with the balance sheet of the business. Many of these differences are normal for certain businesses. My friend Ron Schreiber told me about a software distribution business he and his partner Jordan Levy ran in the mid 80s. They would buy software from Microsoft, Lotus, and others in bulk and sell it in small quantities to mom and pop businesses. Microsoft and Lotus wanted to be paid upfront when the shipped the software but the mom and pop businesses were running on fumes and could not pay until they sold the software. So Ron’s business, called Software Distribution Services (of course), was always out of cash. In Ron’s words, they were a bank and a distribution company and weren’t getting paid for the banking part of their business. All during this time the revenue line and the operating income line was growing fast and furious as desktop software went from a niche business to a mainstream business. Eventually Ron and Jordan had to sell their business to Ingram, a large book distributor who had the financial resources to provide the “banking services”. They made a nice hit on that company, but not anything like what Microsoft and Lotus did even though they grew their topline just as fast as their suppliers. Ron and Jordan’s business was “working capital intensive.” Working capital is the non cash current assets and liabilities of the business. When they grow rapidly in relation to revenues, it means you are financing other parts of the food chain in your industry and that’s a great way to run out of cash. So if monthly income and monthly cash flow aren’t in the same ballpark, look at the changes in working capital month over month. We went over this a bit last week in preparing the cash flow statement. If working capital is the culprit soaking up the cash, you need to look at two things. The first is if the revenues are real. A great way to inflate revenues is to “ship product” to people who aren’t going to pay you. A company that is doing that is operating fraudently so you don’t see it very often. But if someone is doing this, cash will be going down while profits are steady and accounts receivable are growing rapidly. I always look for that in a company that is supposed to be profitable but is sucking cash. The second is the availability of working capital financing. If a business can finance its working capital needs inexpensively, then it can operate successfully with this business model. In times when debt is flowing freely, these can be good businesses to operate. When cash is tight, they are not. The final thing to look for on the balance sheet is capex. If a business is operating profitably, and growing profits, but its capex line is growing faster than profits, it’s got the potential for problems. Hosting companies are an example of a set of companies that might be in this situation. Again, the availability of financing is the key. Local cable operators operated profitably for years with big negative cash flows because of capex. The fiancial markets like the monopolies these busineses were granted and consistently provided them with financing to buy more capex. But if that party ends, it can be painful. This post is three pages long in my editor so it’s time to stop. There is more to discuss on this topic so I’d like to know if I did this topic justice for most of you or if you’d like another post that digs a little deeper. My preference is to move on because I’m getting a bit tired of writing about accounting every Monday, but most of all I want to cover the stuff you want to learn or freshen up on. So let me know. 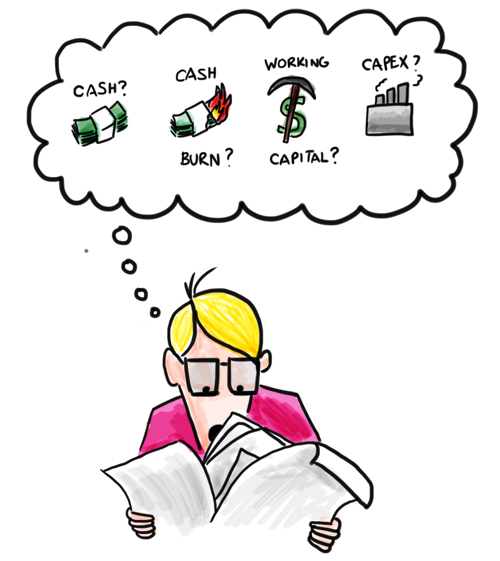 – I think that before looking at cash (agreed, cash is king) or anything else, if you want to look at financial statements, the first thing you need to look at is the accounting *choices*. Accounting is an art and not a science, and the accountants can sometimes record the same event in different ways. It doesn’t mean there’s any fraud but it does mean you need to be aware of it. A great example was an etailer from the 90s, which had booked expected carried back taxes over the previous year’s losses as revenues, and so was showing a “profit”. If you hadn’t read the auditors’ statements regarding that, you would’ve thought that they suddenly became profitable from operations. Not so. – I also think the #1 thing to remember about analyzing financial statements (and the one that b-school students with a “check the box” mentality tend to forget) is that you need to look at the trends OVER TIME. No matter how detailed, a statement for one period is basically useless if you want to *analyze* how a business is doing. Looking at one period is fine if you want to understand the financial statements themselves, but if you want to understand the *business* you need to figure out what are the trends over time. Obviously this isn’t always easy when you’re dealing with a startup’s numbers but even three months’ worth of data doesn’t give you 3 times better insights as one month. It gives you 10 times. By the way, this is why I love using Tracked.com to check out a public company, because the statements are broken out in an easy to read year over year or quarter over quarter format, and you can toggle between absolute numbers and ratios. Yahoo! Finance and others are great if you want to look at *stocks* but before I look at a stock I need to understand the *business* behind the stock and for that I need to look at the financial statements. – You mention working capital without clearly explaining what it is, beyond the accounting notion. I’ve said it before under an earlier post: I think working capital deserves its own post (as does probably, but maybe that’s a bit too technical for what you’re doing here, EBITDA, and how that’s a very useful notion but how it can also trick you sometimes). It’s just a crucial notion. Your example of a working capital heavy business, typically software distribution, is just perfect. It’s great that they got a good exit because if you’d told me about that business, without even thinking I would’ve said: 1- what delays do their suppliers give them? and upon hearing that they pay their suppliers right away, I would’ve said “death spiral.” Working capital can kill you. It can also be magic when you have a low working capital, or even better negative working capital, business (Amazon, Wal-Mart). Either way it’s just crucial to understand it, especially as you try to manage growth in a fast-growing business. This post was originally written by Fred Wilson on April 5, 2010 here.